Indian cuisine consists of a wide variety of regional and traditional cuisines native to the Indian subcontinent. Given the range of diversity in soil type, climate, culture, ethnic groups, and occupations, these cuisines vary substantially from each other and use locally available spices,herbs, vegetables, and fruits. Indian food is also heavily influenced by religion, in particular Hindu, and cultural choices and traditions. Also, Middle Eastern and Central Asian influences have occurred on North Indian cuisine from the years of Mughal rule. Indian cuisine is still evolving, as a result of the nation’s cultural interactions with other societies. Tandoori chicken was invented by Kundan Lal Gujral, a Punjabi Hindu, who is the founder of the Moti Mahal Delux restaurant. Gujral founded the restaurant in the Peshawar area of pre-partition India, which is now in Pakistan. In the United States, tandoori chicken began appearing on menus by the 1960s. Jacqueline Kennedy was reported to have eaten “chicken tandoori” on a flight from Rome to Bombay in 1962. A recipe for tandoori chicken was printed in the Los Angeles Times in 1963, for the hostess in search of a fresh idea for a party dinner a similar recipe was featured in the same newspaper in 1964, along with other chicken dishes from world cuisines. Tandoori chicken is chicken dish prepared by roasting chicken marinated in yoghurt and spices in a tandoor, a cylindrical clay oven. It is a popular dish from the Indian subcontinent and has become popular in other parts of the world through restaurants serving food from the Indian subcontinent. The raw chicken is marinated in a mixture of yogurt and the spice tandoori masala. Cayenne pepper, red chili powder or Kashmiri red chili powder is used to give it a fiery red hue. A higher amount of turmeric produces an orange colour. In milder versions, both red and yellow food colouring are sometimes used to achieve bright colours, but turmeric powder is both mild and brightly coloured, as is paprika, a sweet red pepper powder. 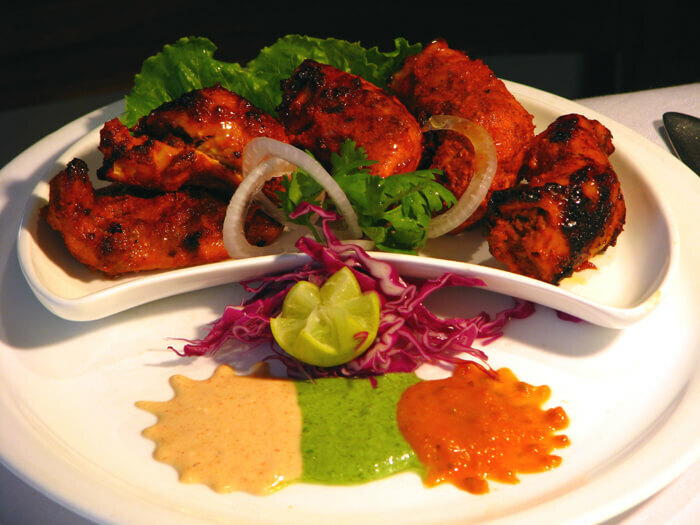 The marinated chicken is placed on skewers and cooked at high temperatures in a heated clay oven known as the tandoor. It is heated with charcoal or wood which adds to the smoky flavour. The dish can also be cooked in a standard oven, using a spit or rotisserie, or over hot charcoal. Tandoori chicken can be eaten as a starter or appetiser, and as a main course, the latter with naan (an Indian flatbread).It is also used as a base chicken in numerous cream-based curries such as butter chicken. Tandoori chicken was popularised in post-independent India by Moti Mahal Delux in Delhi when it was served to the first Prime Minister of India, Jawaharlal Nehru. After that Tandoori chicken became a standard offering at official banquets. The fame of tandoori chicken led to many derivatives, such as chicken tikka (and eventually the Indian dish popularised in Britain, chicken tikka masala), commonly found in menus in Indian restaurants all over the world.